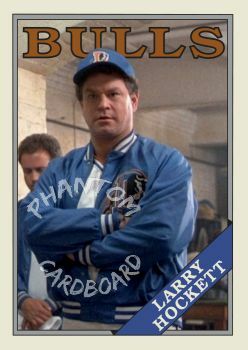 When I decided to do some Bull Durham cards with a 1988 Topps baseball theme (the year of the movie's release) I did not know Topps had already done them as special insert in their 2016 Topps Archives set. Usually the point of my cards is to make something that was never made, but I made an exception because there was a couple of things I wanted to tweak. As you'll see, not drastic. 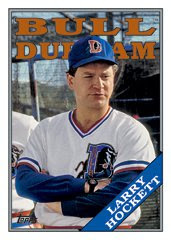 I used a different image and I wanted it to read "Bulls" instead of "Bull Durham" in the team nameplate. 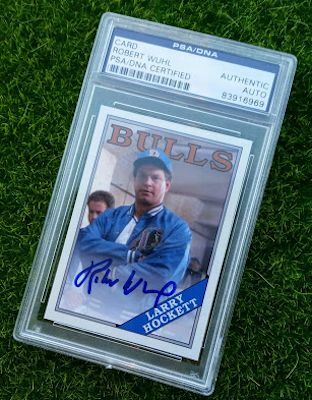 I got this back from Mr. Wuhl fairly quick. He's a great signer. I got some of the 1989 Topps Batman cards signed previously with him as reporter Alexander Knox.